Meet the instructors at Roadrunner Driving School. I began teaching Driver Education and Driver Training for other driving schools in 1993. I felt there was a lack of quality instruction, integrity, and service in the industry, so I opened Roadrunner Driving School in 1997. My background includes traffic accident investigation at Santa Rosa Police Department and completion of Defensive Driving and Emergency Vehicle Operations Courses at the California Highway Patrol Academy. I drove a tractor trailer for several years making deliveries between San Jose and Fort Bragg, and I drove a school bus in Sonoma County for 4 years. When I was sixteen, and newly licensed, I often hauled several horses to Annadel State Park or Point Reyes National Seashore to ride for the day. A couple of horses in a trailer behind you will teach you to drive safely up and down hills, on winding roads, on the freeway and at night. I drive a red 4-door Toyota Camry. 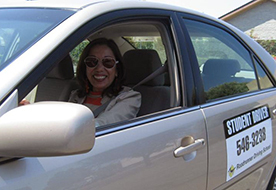 As an examiner, Lupita knew if she was calm and friendly with nervous drivers about to test, they were more at ease and confident and performed better during the test. She takes the same approach with her students at Roadrunner Driving School and it is working really well. Lupita teaches in both English and Spanish. Tiffany is an enthusiastic teacher who enjoys guiding the process of learning, and her ultimate goal is for all students to really get a solid understanding of the rules of the road. Her classes are full of information, but also fun facts, creative ways to learn, and stretch breaks. 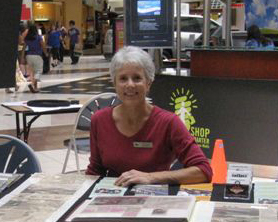 She has been a tour guide and has driven may different vehicles over the years, including a 1950s Dodge Power Wagon (for Safari West), a converted Jeep (for Wine Country Jeep Tours) and a Turtle Top bus, and she previously held a Class B license. 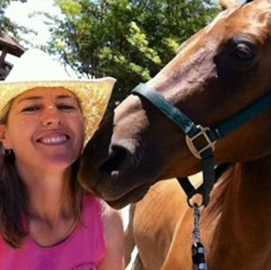 When she is not teaching the Driver Education class, you can often find Tiffany spending time with her horse Tango or hiking the hills with her dog Sara.